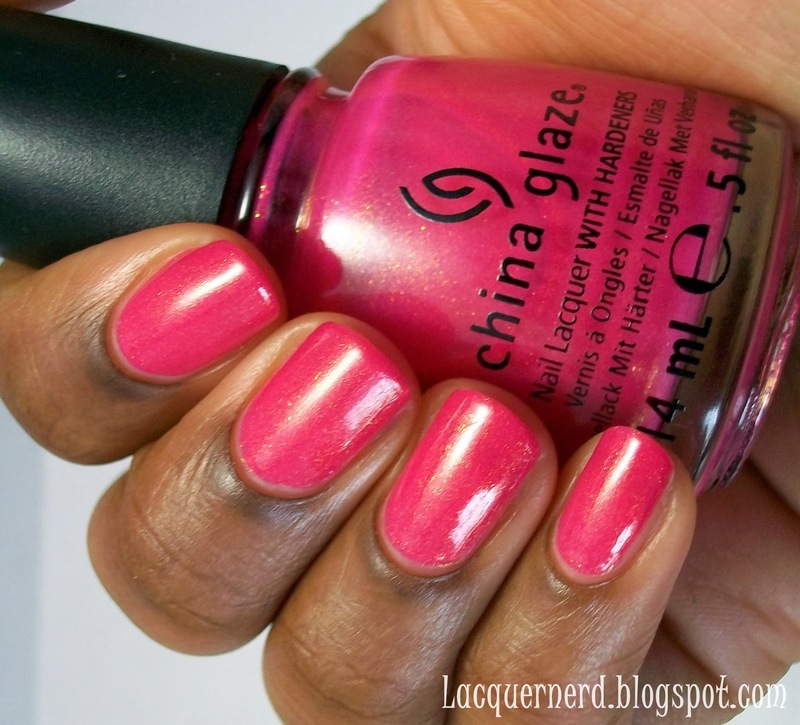 Today I have a swatch of China Glaze's Strawberry Fields. I don't know why it took me this long to pick up this polish because it's based on my favorite fruit: strawberries. I love strawberries so much, it's a problem. I can eat a whole carton of them and still not get sick of them lol. I was really excited to pick this polish up during the Sally's BOGO sale on China Glaze polishes (and I got the last one too!). Let's see the polish! Strawberry Fields is a medium pink jelly with gold glass flecks. This is three coats with a top coat. My camera made it a little lighter than it really is for some reason. It's a tad bit darker than what my photos show. 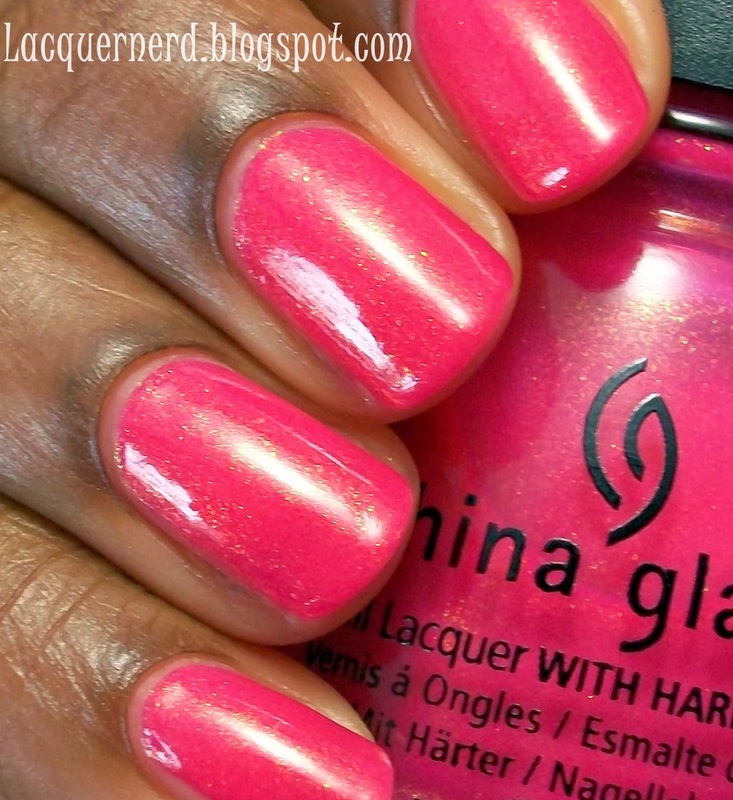 The application and formula was great with this polish. The first coat is pretty sheer, but the color builds up after the second and third. I had no problems with this polish. Since it's a jelly, it takes a little bit longer to dry, but it's not a big deal. I wish my camera captured the gold glass flecks better, but I did a closeup so that you can see it better. It kind of reminds me of strawberries, but at the same time it doesn't. I think if it was a bit more red it probably would. If anything, it reminds me a watermelon color (which I like as well!). It's a pretty polish nonetheless. Overall, this is probably my favorite pink in my collection right now. It has a great formula and the glass flecks really make it pop out. I'm planning on doing some nail art with this as my base, so look out for that tomorrow! What do you think of this polish? Does Strawberry Fields remind you of strawberries? Let me know in the comments!